A decade ago, Dan Nafziger never imagined he would be trying to convince anybody to come to Eastern Mennonite University as an enthusiastic admissions counselor. 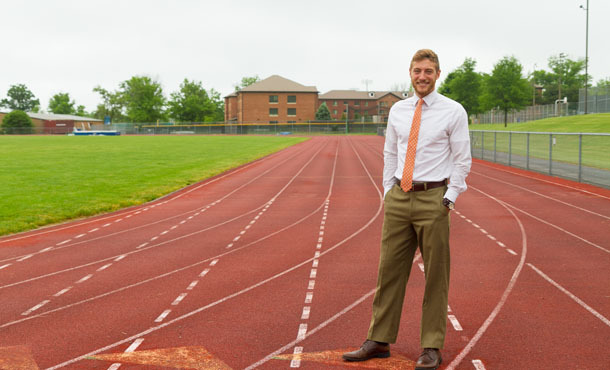 When Nafziger graduated from Harrisonburg High School in 2009, the track standout had other things on his mind than attending the small university where his father was vice president of student life. EMU was always on the radar, but Nafziger said he felt more pressure than desire to attend. Instead, he looked to the myriad of Virginia colleges which had offered him track scholarships before finally accepting a partial scholarship to attend George Mason University, a Division I school in the suburbs of Washington D.C.
Nafziger remembers this decision as being based on pride. The scholarship proved that he was able to compete at the highest level, and the school’s distance from Harrisonburg was a way of showing that he was moving past his hometown. As Nafziger soon realized though, pride was not the best way to choose a school. In his first year, Nafziger said that he only talked to one teacher and that was during his transitions class. He trooped through a succession of lecture halls with hundreds of people and impersonal experiences. In addition to athletic success, at EMU, Nafziger found old friends and made new ones, and enjoyed the support of faculty. With caring mentors, he explored his options, changing his major twice before graduating with a B.A. focused on counseling with a minor in biology. Following graduation in 2013, Nafziger began working with troubled youth. After a few months, though, Nafziger found himself missing the EMU community. “Where can I do the most amount of good?” he asked himself. For Nafziger, the answer was back at his alma mater. “I was a transfer, an athlete, a team captain, and I changed majors. I can speak to a lot of experiences” – including the benefits of a smaller school.